NEW YORK - March 28, 2017 - PRLog -- Hailing from South Sudan, Neveen Dominic often struggled to find cosmetic products made for her ebony skin tone. With so many cosmetics companies touting their foundations' "wide range" of skin tones, Dominic was often let down when she found that these same companies' color ranges so often stopped short at "mocha." She remembers the days she struggled to find any products to suite her skin tone and although she was passionate about beauty, the limited product choices made it hard to achieve that glam look every girl dreams of. The job of perfecting the complexion is even more daunting for dark skinned women, who often have to perfect intricate makeup techniques or are left without being able to wear makeup at all. She noticed that even professional makeup artists shied away from taking clients with deep skin tones because of the limitations in their own product offerings. When Neveen saw other dark skinned women turn towards extreme methods such as skin bleaching to fit more Eurocentric standards of beauty, she knew that the issue was more than skin deep. Fed up with having to compromise, Mrs. Dominic created Neveen Dominic Cosmetics with the goal of making all women look and feel beautiful, regardless of skin tone. The philanthropist and entrepreneur had a vision for celebrating and embracing multifaceted beauty and making accessible cosmetics for diverse women. With her mission in mind and after over two years of research, testing, and development, the Juba Collection was born. Named after the capital of Sudan, the Juba Palette is made of only the highest quality products to nourish the skin and enhance the complexion. The Juba Collection features concealers, compact powders, eyeshadows, blushes, bronzers, eyeliner, lip gloss, lipstick and six foundation shades. Designed to suit and compliment deeper and hard-to-find skin tones, the Collection promises to empower women by providing a quality cosmetic line for women who've been ignored by other brands. It further serves the purpose of restoring professional makeup artists' confidence and diginity to service a wide range of skin tones. 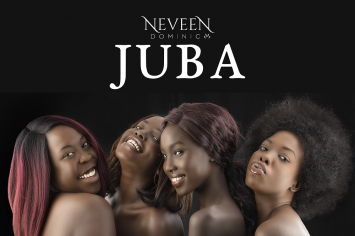 The Juba product line will be available online for pre-order beginning on April 1, 2017 at https://neveendominic.com/ and ready to purchase at IMATS New York (Booth # 612) April 7th – April 9th 2017. Portion of proceeds from the launch in New York will go to the Youth Empowerment Scholarship which aids South Sudanese youth further their education. For more information about Neveen Dominic Cosmetics visit https://neveendominic.com/. For press and business inquiries contact Sschirru@dynamicallybpr.com.